Extending the life of the shaft seals on larger wastewater pumps has many advantages. When a shaft seal fails the main pump has to be removed from service and repairs can be costly. With this in mind, many system designers specify an external flow of seal water to cool the main pump shaft seals all with the intent of extending seal life. Often times the supply is potable water, requiring a physical separation of the source. Seal water pump system with attached break tank installed at a major wastewater treatment facility in Broward County, Fla. When potable water is used to provide seal water flow, it is important to address the need for back flow prevention. Many designers and public health authorities favor a physical air-gap/ break tank as a positive means of separating the water source from the process. Physical air gap type systems require a pumping system to re-pressurize the water for seal water service. 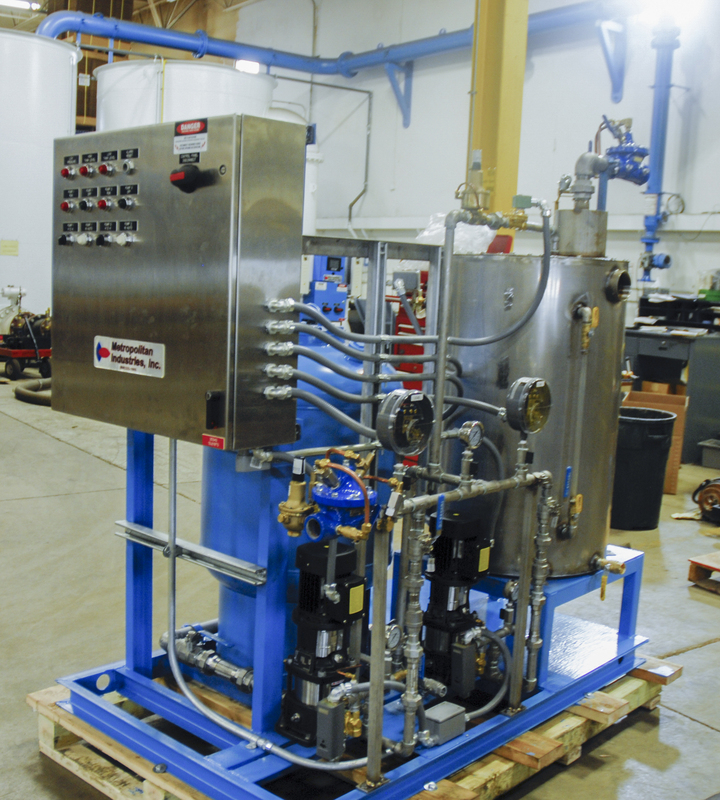 Recently, Hazen & Sawyer Engineering turned to Metropolitan Industries to recommend a seal water pump system for a major wastewater pumping facility in Broward County, Florida. This main pump station pumps raw sewage to the regional wastewater treatment plant that services over 600,000 residents. Included in the design was a seal water system with a physical air-gap/ break tank intended to supply seal water and also protect the community water source. The main pumps used at the Broward County facility included three 250 horsepower high flow pumps and one 60 horsepower low flow pump. The seal water flow rate required for each of these pumps was 2 GPM, a total of 8 GPM of seal water flow required. Supply pressure is carefully coordinated with the seal manufacturer’s specifications. The diagram above explains the flow of the seal water. 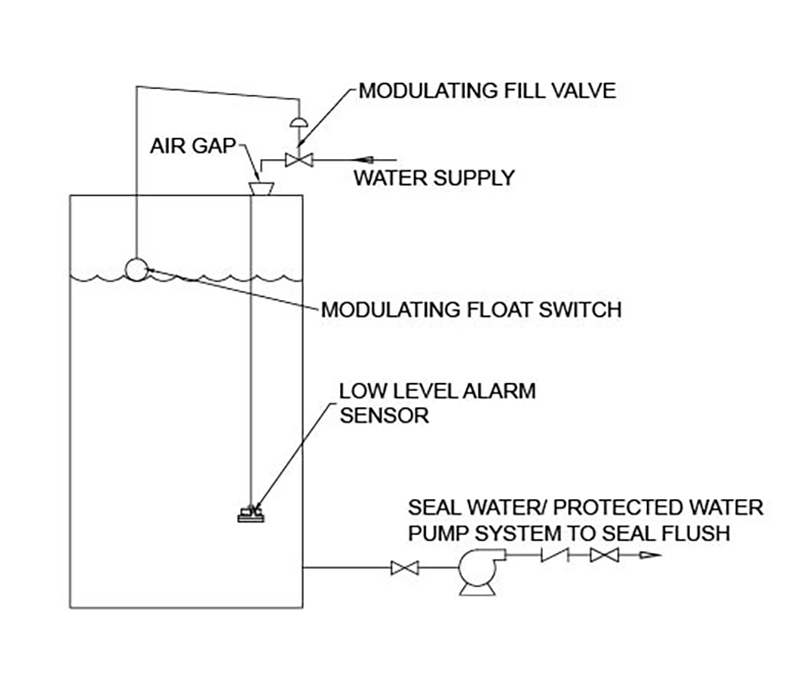 The seal water system was designed as a totally integrated package with an air gap tank, pumps, piping, valves, safeties and controls. The package is factory prefabricated, tested and delivered to the site as a complete assembly for ease of installation and integration with on-site utilities. A pressurized supply of clean, cool water is key when protecting the shaft seals of large wastewater pumps. Flushing water helps extend seal life and minimize downtime and costs associated with repairs. An air gap type seal water pump package is an ideal choice if potable water is chosen as the source.